EMERGENCY ONE | Haven Fire & Safety L.L.C. E-ONE is a worldwide designer, manufacturer and marketer of fire rescue vehicles with more than 23,000 vehicles in operation around the world. Headquartered in Ocala, Florida, E-ONE is a part of the federal Signal Group and is the industry leader in product innovations, new technologies and exceeding customer expectations. E-ONE manufactures aircraft rescue firefighting and aerial vehicles to meet the needs of fire departments, rescue/EMS squads, airports and Homeland Security agencies. Just as important as the full product line, is the fact that E-ONE engineers and builds the complete vehicle - chassis, cab, body, tank and aerial device. Because E-ONE is a single source manufacturer, the customer's after sale needs are satisfied with just one call to Haven Fire and Safety as dealers for Dubai and the Northern Emirates, or E-ONE for parts, service, warranty, training and manuals. Established in 1974, E-ONE has grown to become an industry leader in just a few decades, and today employs more than 1,300 people in five plants totalling more than 420,000 square feet. Innovation has been the company's driving force and continues to be the impetus behind its pursuit of new technologies. The result is state-of-the-art fire rescue vehicles recognized for superior firefighting and rescue capabilities. There are countless reasons why you should choose E-ONE. Here are just a few. Your department can expect many years of service with an E-ONE. The high-strength extruded aluminum design and construction provides unmatched structural integrity. E-ONE vehicles feature extensive compartment storage to hold a substantial amount of firefighting and rescue equipment. The features and options of E-ONE products allow your department the ability to afford the vehicle you need. As standard, all E-ONE trucks feature stainless steel plumbing for superior water flow efficiencies and corrosion resistance. With multiple manufacturing facilities, E-ONE is able to provide one of the quickest deliveries in the industry. E-ONE's quality management system is ISO 9001 Certified. E-ONE is a single-source manufacturer of the cab, chassis, body and aerial device. With the best warranty package in the industry, E-ONE vehicles have a 10-year body structural warranty, a 10-year stainless steel plumbing warranty, a 10-year paint warranty, a 20-year aerial device structural warranty, a lifetime corrosion perforation warranty and a lifetime water tank warranty. For service and maintenance throughout Dubai and the Northern Emirates, E-ONE vehicles are supported by Haven Fire & Safety, fully trained to help keep your truck ready to respond. For 30 years, E-ONE has been an industry leader in the engineering, manufacturing and delivery of Aircraft Rescue Fire Fighting (ARFF) apparatus world-wide. 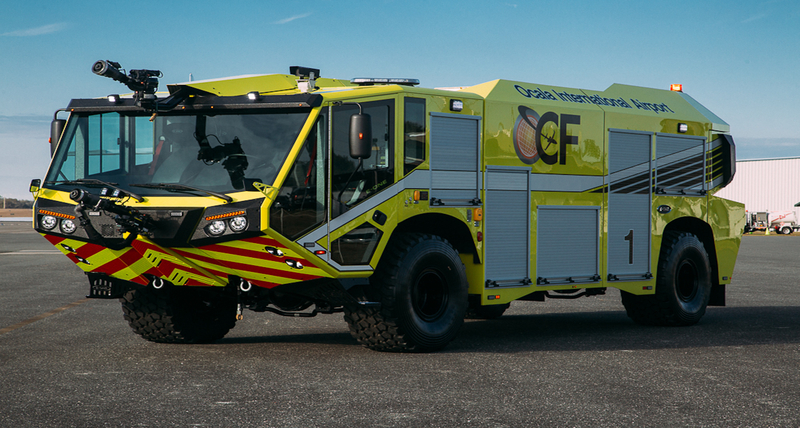 The newly redesigned Titan Force ARFF vehicles continue that tradition of excellence. The Titan Force 6x6 exceeds industry standards with both safety and comfort in mind. The cabin boasts an unsurpassed static roof load of 58,000 lbs – more than double that of ECE-29 compliance standards for structural integrity. The new cabin offers improved visibility with the addition of overhead and larger side view windows. The comfortable interior of the E-ONE cab is large enough to carry a crew of five while offering ergonomically and centrally located vehicle controls and displays for improved efficiency. The Titan Force is powered by the EPA Tier III compliant, 665 horsepower Cummins QSX engine combined with an Allison EVS 4800 transmission offering a smooth ride, superior acceleration and reliability.